See photos from the awards ceremony here. Title: Increasing the Cost-effectiveness of Florida’s Freshwater Fisheries Long-term Monitoring Program. Title: Comparison of Diploid and Triploid Largemouth Bass Growth and Maturation in Puerto Rico. The North Carolina Subunit is a great pleasure to work with. In addition to participating in the AFS at the Chapter, Division and Parent Society levels, the Subunit is active in a variety of education and outreach activities. These include judging elementary school science fairs, speaking to classes, working with 4-H and the Boy Scouts, conducting numerous cane pole fishing events, and coordinating and overseeing the fisheries portion of the field competition at the annual Southeastern Wildlife Conclave. The Subunit raises funds that provide travel scholarships for undergraduates, women and minorities, and graduate students to attend meetings. 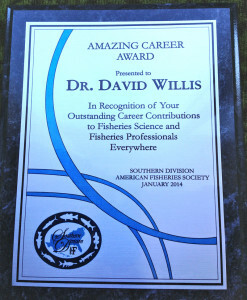 BE IT RESOLVED, that the membership of the Southern Division of the American Fisheries Society, assembled here in Charleston, South Carolina on this 24th day of January 2014, awards Dave Willis the first-ever Southern Division “Amazing Career” Award, in recognition of Dave’s exceptional personal and career contributions that have greatly benefited fisheries education, fisheries science, and fisheries management in our Division, throughout North America, and even throughout the world. An award plaque and a copy of this resolution were sent both to the Willis Family and to the Department of Natural Resources Management at South Dakota State University, which Dave Willis headed in recent years. SDAFS thanks the Oklahoma Department of Wildlife Conservation for their efforts to host the 67th Annual Conference of the Southeastern Association of Fish & Wildlife Agencies in October 2013.